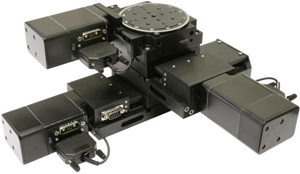 Precision motorized XY Table - Rotary Table LSMA-RTHMcombination positioning stages offer superior positioning performance in a very compact, low profile unit. They are ideal for space-critical optical, semiconductor, laser and vacuum applications. Constructed from a special lightweight machined aluminum alloy to provide high stiffness and long-term stability with linear ball bearings for low friction and superior motion smoothness. These precision actuators with micrometer-grade 0.5 mm pitch screws provides exceptional accuracy, repeatability, and ultra-fine positioning resolution. Stages can be driven by brushless servo or micro-stepped motor. micro-stepper, DC servo, "Smart motor"